I’ve been coaching a few newbies on their exercise recently and it has really made me realize how many people don’t workout within the proper rep ranges. Just watch today’s short video and once you understand the proper rep ranges to use, the next time you exercise you’ll stimulate twice as much muscle and could nearly double your calorie burn. And a bunch more cool randomness about tension, mitochondria and glycogen utilization. Bottom line: This video will ensure you’re not wasting time and energy the next time you workout. Nothing for sale, just a quick vid to help you out! Make sure you “like” it and just drop a comment if you have a question. Knowledge IS power – WHEN it’s applied. Stay fit and keep learning! 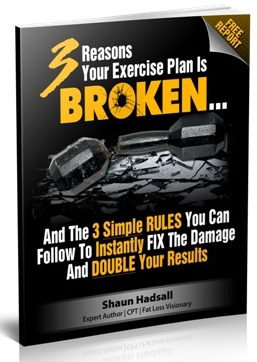 “3 Reasons Your Exercise Plan Is BROKEN” – And the 3 simple rules you can follow to INSTANTLY fix the damage and double your results. Shaun, with the different number of reps, are you using differentweights? Hi Dave…way to take action bro! Love to hear stuff like that…ok to your Q. You can really do whatever you want Dave. Just make sure you’re sweating and using a talk test. In other words, if you can have a conversation with someboyd next to you then you’re not going hard enough…but if you feel like you’re having to slow down periodically…you know you’re going to hard. bursting portion with different stimuli to keep the hormones responding. Good work Dave. Stay fit and keeeeeep movin! Absolutely. You the lower the reps, the heavier the weight and as you move throughout your workout and fatigue..you should gradually start lower the weight and upping the reps.
Hope this helps…my free report is coming you way and it will give you a bunch more tips about this stuff. Have a great night!! @ Mary…sorry Mary…let me clarify one more time…lol.